Axis Of Oversteer: Great Week End for Team Axis! Great Week End for Team Axis! 4 wins (5 if you count Time Trials) and 6 podiums for Team Axis this Memorial Day week end. 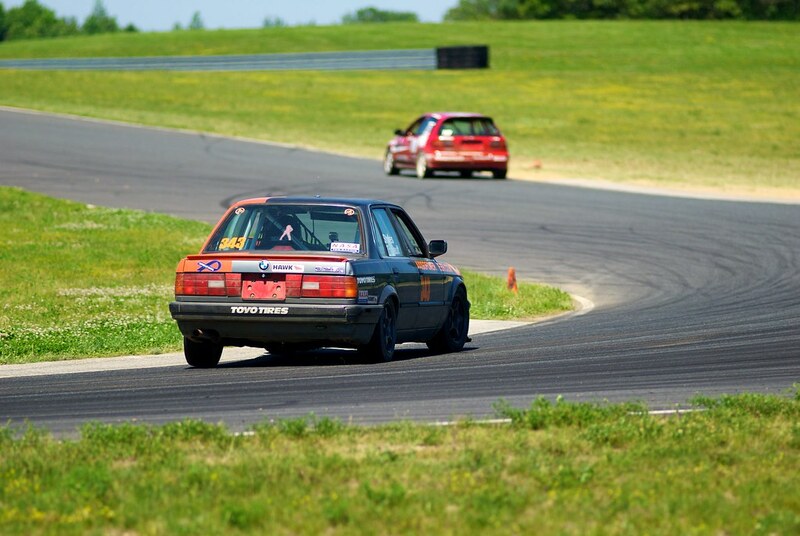 On Saturday, at New Jersey Motorsport Park with NASA, Pete took first place and set an new track record in Spec E30 with the Freep coming in third. On Sunday places were reversed with the Freep taking a commanding victory with a car severely damaged by shrapnel from a competitors exploding motor. Peter was right behind for and Axis 1-2. IN GTS3 on Saturday Stee avoided on track trouble to come in fourth. I held up the flag at the TimeTrial TTB class. Start of Sunday's Spec E 30 race from Pete's car. Pete started 5th and climbed up to 2nd place. The trick with Spec E30 is to keeping momentum so brakes, well, they don't see much use. The big annual Porsche Club were at Watkins Glen and CG, as I predicted, laid waste to the competition winning Saturday in H-Stock configuration and taking the overall win in the Enduro on Sunday with a big wing I-Prepared. Next big event will be Hyperfest at Summit Point, see you there! CG in the H-Stock Sprint race, dicing with Baron Jacobs in the Green 911. Nice work, fellers! Livin the dream. Pete did ya get into the 1:18's? What is the new track record. Pete's fast lap was 19.3, off the top of my head.